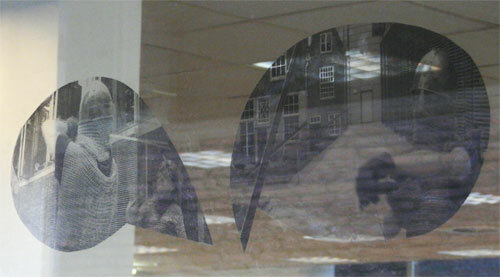 Transparencies of stills from a performance. Each is approximately 18 x 25 cm. These are stills from a June 2012 performance (more about this film is here) filmed by Carmen McGlinn of a 19 year old in a swordfight with his mother, Sonja van Kerkhoff. 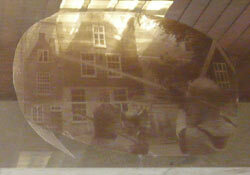 It was set in a historic courtyard in the centre of Leiden. The 20th century building and terrace of the Concert Hall (The Leiden Stadsgehoorzaal) is flanked by 15th century buildings that used to be the Aalmarkt school (hoogwaarschijnlijk gebouwd in 1454 - 1460) which were a later addition to (Sint-Catharinagasthuis) hospital, hostel and school complex established in 1275 for the poor of Leiden. So the performance itself took place in a location soaked with a history of love for the welfare of one's fellow citizen. These days the courtyard only accessible to those who attend an event in the Concert Hall. The performance centered around the outdoor sculpture, "Room of Memories" by Sen McGlinn and Sonja van Kerkhoff. 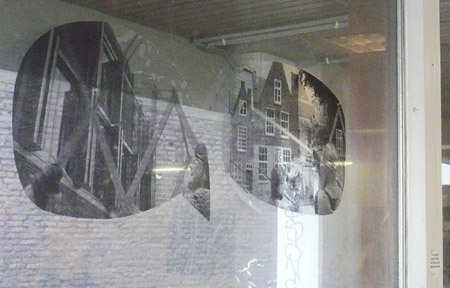 For the "Kunst en ander(e) strips"
(Art and Other Cartoons) exhibition in Galerie de Pieter I placed the title inside a speech bubble and placed Dutch and English versions on alternating frames along the wall of windows. Thumbnails of prints 1987 onwards.